House Rules pips MasterChef, Nine holds Sunday. House Rules had its best numbers this season with 1.03m viewers last night, enough to eclipse MasterChef‘s 956,000 despite the lure of Nigella Lawson. But while The Voice held the slot on 1.24m viewers there are differing preferences across statelines. The Voice is the choice in Sydney and Brisbane, MasterChef rules Melbourne and House Rules is tops in Perth and wins by just 1000 viewers in Adelaide. The premiere of DNA Nation drew a good number by SBS standards, at 368,000 -likely to top their week. Nine network won Sunday with a 29.0% share then Seven 28.3%, TEN 18.4%, ABC 17.3% and SBS 6.9%. The Voice was best for Nine at 1.24m viewers then Nine News (1.2m) and 60 Minutes (748,000). Inside the World’s Toughest Prisons was just 318,000. Seven News was #1 for Seven at 1.44m for Seven then House Rules (1.03m) and Sunday Night (617,000). The Blacklist was only 327,000. MasterChef Australia (956,000) led for TEN. Shark Tank was 596,000, Modern Family was 548,000 / 391,000, and TEN Eyewitness News was 421,000. Grand Designs (872,000), ABC News (862,000) and Midsomer Murders (764,000) comprised ABC’s night. Compass was just 262,000. On SBS it was DNA Nation (368,000), Cleopatra’s Lost Tomb (271,000), SBS World News (216,000) and Uranium: Twisting the Dragon’s Tail (186,000). ABC2’s Ready Steady Wiggle drew 235,000 as best on multichannels. Source: OzTAM Overnights: Sunday 22 May 2016. Shark Tank figure is a peak. House Rules should get a flow on from its news service. Poor Ten has to lure them from the 2 shows that started 30 mins prior and from a stronger lead in. I reckon they show try shark tank an the earlier time of 6.30pm. Masterchef third but topping the demos! Enjoying this season. Nine is appropriately rewarded for all their d*cking around with Inside the World’s Toughest Prisons. Looks like they dropped the soap on that one. I watched the last 2 eps of the nutty The Spoils Before Dying with non-TV stuff either side. I can see ‘The Blacklist’ gaining a lot of timeshifted viewers since it was a season finale that finished at midnight. Unsure if it will be enough to make up the 0.7% though. 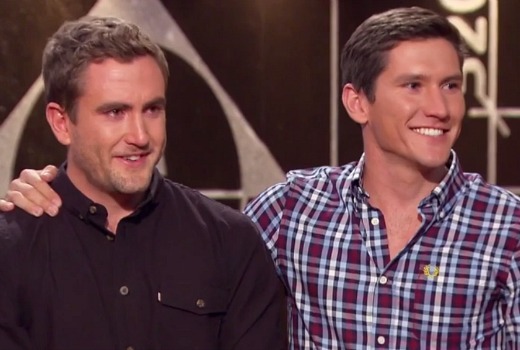 I would expect good results for House Rules last night, as the episode focussed on the hugely loveable twins (pictured in the story). Such wonderful young men make great viewing, and watchers really wanted them to be rewarded well. I agree, but HR always builds as the season progresses and as the Voice wanes, it increases further. I think the shock of colour will attract viewers to next weeks HR Reveal too. So the promos will feature this rather than the unlikeable character of Rob…. From reading forums, it appears that Nigella can be as much of a deterrent as a “lure”. Many people stated they would not watch because they are repelled by her. Frustrating that Shark Tank keeps getting advertised for a 9 o’clock start and then last night according to my EPG wasn’t scheduled to begin until almost 9:20. Really not good enough Ten. Shark tank goes straight to catch up for me cause its on too late. Besides shark tank there is nothing worth watching on sunday nights anymore so last night was netflix/catchup for me. My current netflix voucher is about to expire and at this stage I’m not planning to get another one probably till gilmore girls arrives. I really like netflix but I’m over the netflix originals being pretty much always oddball quirky shows. I can understand the need for something different in the USA when tv drama is more assessable but in Australia drama isn’t as assessable and it would be nice if some their originals were a nice normal mainstream drama. I would like to think Shark Tank ratings have improved, but I suppose there was some Masterchef overrun. I notice it’s also scheduled for 8.40 Wednesday this week. That means madam secretary is scheduled for 9.40pm. I’m glad its the final episode of the season because I’m over channels 10 need to play around with the schedule of that show. you can’t fault Ten much at all, as its been pretty consistent with the scheduling of Madam Secretary. Not lately. They ran a promo at the end of an episode that said it would return in two weeks, didn’t return for 3. They then ran a double episode and now the final episode changed timeslot. So its been all over the place lately. That’s not a way to keep viewers. I know someone who watches it live and they were wondering where it disappeared to a month ago and on wed they will turn it at 8.30ish and find shark tank. They don’t look at tv guides, epgs or websites. They are a normal viewer. They expect to turn on the tv and find their show. Me personally I’ve given up on overseas drama on commercial f.t.a. I’ve already cut shows, I don’t plan to pick up new ones and I’m sticking with select existing shows until they are axed or move to foxtel/streaming. The plan going forward is to watch overseas drama on abc/sbs or netflix (on the proviso that netflix originals improve). Agree….I wont chase something around if the network keeps moving it….Gave up on Madam Secretary ages ago….Tenplay also is not good for me…may be my issue…but I just do not care that much …I do not want to have to work a watching TV….like you say…I just want to turn on and watch…. I do mostly ABC/SBS….I do not have things like Netflix…nor do I want them….plenty on FTA to keep me amused…. The last 4 ep’s in this season for MS have aired: Wed 8.30, off, off, Wed 8.45/9.45, Wed 9.45. Yes it was consistent before that but Ten have been deplorable the last 6 weeks with programming. Thurs night is just as bad as the Wed night treatment. William, I do hope that Ten love you as much as you love them. Unfortunately, your claim of consistent scheduling for Madame Secretary is not supported by any evidence. Rather the opposite, in fact.